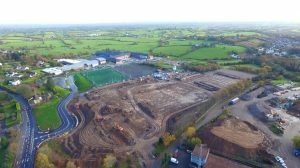 The new school building at St. Patrick’s Academy is now complete with the next phase of works well underway. Works on the new Pavilion are progressing with 20% of the ring beam complete. The main drainage for the Tennis Courts & Training Fields is complete with works progressing on the main Football Pitch. Works on the retaining wall are 65% complete and should be completed in the coming days.